Outline: Disciple's question about forgiveness. Jesus tells story of the servant who owed a huge debt and was forgiven, but was unforgivingof his fellow servant. Remembering Christ's love in paying for our sin will help us to forgive others. End needs strengthening. "How often must I forgive my brother when he sins against me? `Til seven times?" And Jesus answered this question with a story about a certain king who was examining the accounts of his servants. 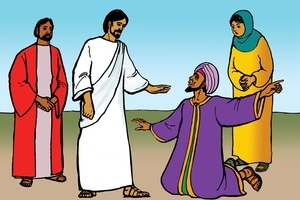 And one servant was brought to him who owed a very very large sum of money - more than one hundred thousand shillings! And the servant had nothing to pay his master. Then the king commanded him to be sold, and his wife and children and all that he had, so that a part of his debt could be paid. But the servant fell down before his king and begged piteously for mercy saying, "Master, have patience with me and I will pay you all!" Then his master felt great pity for his servant, and set him free, forgiving him all that great debt! Afterwards the same servant went out and found one of his fellow-servants who owed him a very small debt - 17 shillings - and what do you think he did? Did this servant say to his brother, "Friend, do not be troubled about that small amount you owe me. Today I am forgiving you this little debt because of the great debt my king has forgiven me." Were these his words? No, it is sad to tell, but the servant actually laid hands on his friend, and took him by the throat saying, "Pay me that which you owe me!" And his fellow-servant fell down at his feet and begged him, saying, "Have patience with me, and I will pay you all!" Yet that servant would not wait but he immediately dragged his brother into the prison until he should pay the debt. Then when the others saw what was done, they were very sorry and came and told their master everything. And the king, after he had called his servant, said to him, "You wicked servant, I forgave you all that debt because you asked for mercy. Should you not have showed mercy toward your brother even as I did toward you? And the king was very angry, and he sent this wicked servant to the tormentors until he should fully pay his debt. Then Jesus said these strong words. "My Heavenly Father (God) will do the same also unto you if from your hearts you do not forgive every brother who sins against you." And those who heard Jesus speak these words said to Him, "Lord, increase our faith." But Jesus replied, "If your faith is as small even as a seed of mustard, you can say to a fig tree with deep roots, 'Be uprooted, and cast into the sea,' and this shall be done." How can I forgive my brother? Friend, Jesus said that just a tiny seed of faith could pull up long deep roots of unforgiving thoughts. But how? Use a little seed of faith in this way. Just look, even for a little while, at that dreadful cross. See there the One Who suffered to pay our great debt of sin against God. One look at such love and such mercy, will melt my heart. Then to rid my heart of unforgiveness will be easy for God's love to do for me. God Himself can change my wicked heart, and He can help me to truly forgive my brother.